Exploring the hidden hamlets of Himachal Pradesh, the famous and not so famous nooks and crannies of the state is something that campers enjoy doing every year. Camping in Himachal Pradesh is certainly the best way to reconnect with nature. Discover the true shades of serene yet volatile landscapes by spending a day in the hills camping. Camping is probably the best holiday activity for those who are seeking for an escape from the mundane hustle and bustle of daily life. Tourist can simply set-up a camp and lose themselves in the rejuvenating atmosphere of the state. The campsites are fantastic as they overlook several snow-capped peaks and are located in the midst of beautiful flower filled gardens. The flora and fauna surrounding the mountains are picturesque and refreshes ones heart and soul. Probably Himachal Pradesh is the only place in India where tourist can set up their camp wherever their heart pleases. 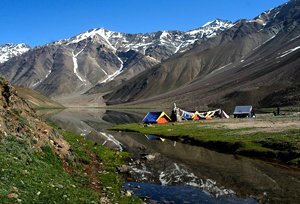 Nevertheless, there are multiple places in Himachal Pradesh, which are the best sights to camp in India. The tiny hamlets of Chail (Near Shimla) are the popular camping destination in Himachal Pradesh. 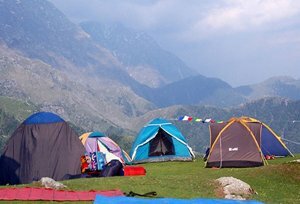 Beas Kund (Delhi-Manali-Solang Nala), Triund (Delhi- Dharamshala), Malana - Pulga - Kheer Ganga (Delhi-Kullu-Bhuntar-Manikaran) are some of the best places to gratify one's thirst for camping. Some of the prominent camping sites in Kullu are Raison, Solang Nullah and Shoja. Besides camping, these places offer a huge scope for adventure activities as well. Mostly districts in Himachal Pradesh are majorly untouched by modernization. The camping destinations in Himachal Pradesh are surrounded by jungle on three sides and are a scenic delight during sunrise and dawn. Enjoying a day camping in the foothills of Himachal Pradesh is an experience of a lifetime.